For the first time ever, we're having a FLASH SALE in our Etsy Shop!! The art prints listed below will only be available for purchase through Wednesday, Dec 16th. Our plan is to (fingers-crossed) stock the Jitney's shop with tons of art prints this February (see below for more details). YAY!!! These will be perfect to place in your own home or to give as gifts (especially if you attach it to the outside of a package - SO cute!!). I have intentions of selling pretty much all of the artwork I create, but I decided to hold on to this one. I've seen this quote floating around Pinterest and Etsy for a while now but I've been so inspired by it. The quote actually derived from Kate Forsyth's The Witches of Eileanan, "May my heart be kind, my mind fierce, and my spirit brave." I haven't read the book but I do love this quote. When I finished painting this girl, she seemed to hold all of these characteristics. Obviously, she's not real but an artist becomes connected to the person or objects in the artwork, just as a writer becomes connected to the people (fiction or non-fiction) that he / she writes about. Trust me, as I'm writing this, I'm questioning if I should share this or not. I realize how crazy it sounds. But I'm trusting that you'll either disregard the craziness and continue to read future blog posts or you'll love this piece and totally relate to what I'm saying. Kind heart, fierce mind, brave spirit: these are characteristics I pray to develop in my own life. I lack each one daily but it is because of the grace of God that I entail these characteristics at all. This painting hangs in my studio along with a few other favorites of mine. It is a reminder of who I want to be and the warrior heart I strive to attain. What quote or scripture are you drawn to this week? But before you purchase, read the story behind this print below. Hint: You may find a little surprise waiting for you at the bottom of the post. In all honesty, many of my days feel chaotic. My mind is a jumbled mess and my path seems completely at a standstill, blocked by trees (at least the view is nice!). During JD's most recent trip, I decided to take a watercolor class. This class was amongst many, many things I did during his absence to keep my mind preoccupied and my hands busy (so that I wouldn't bite my fingernails - a dreadful habit I never noticed until my brother pointed it out a couple of months ago). While searching for inspiration, I fell in love with a quirky yet charming photo of pigeon-toed vintage brogue shoes. I immediately began sketching and painting. Most days, I'm super quirky. But not on purpose. It just happens that way. My feet turn inwards and my face turns a sweet shade of pink when conversations navigate towards me. Some days I feel completely confident in what I'm doing in life. Then I snap back to reality and realize I have no. I. dea. And that's okay. "Your path is beautiful & crooked & just as it should be." Just being honest here... it would be nice to have thousands of "likes" on FB or Instagram on all of the things I post but that's certainly not the case. This watercolor, however, had the most "likes" - by far - of anything I posted. That tells me that you're with me. Not only do I need to be reminded that my path is beautiful & crooked & just as it should be, but YOURs is too! So let's walk these paths together. Our beautiful, crooked, just as they should be, paths. Side note: In honor of our first "Watercolor Wednesday", we're offering free shipping on your purchase of this watercolor print. Use code YOURPATH at checkout. Offer expires Sunday, September 28!! My friend Judy was at it again with another brilliant idea. (I should really make a "tag" for her so you can see all of the artwork we've collaborated on.) Her husband's birthday was coming up and she wanted to give him a custom piece featuring Jeremiah 17:7-8 with a tree of some sort and maybe a river running across it somehow. I'm not sure if this is what she had in mind originally but I ended up creating the artwork on barnwood with a typography mixture of my handlettering with a clean, sans serif font. I fell in LOVE with it and I'm hoping they did too! As always, I'm deeply encouraged by the scripture I have the blessing of working with. There is beautiful hope and pure Truth in these verses. Oh, I just love it. Find this and other custom artwork from Jitney's Journeys here. If you would like to order a custom piece of artwork or something similar to this, contact us here. A sweet friend, Halee, asked me if I could make something special for her mom's birthday, specifically a piece focused on Proverbs 31. After brainstorming different ideas, we decided on a fabric collage with a neutral color palette and pops of pink and turquoise, as well as burlap and lace. I embraced the theme of threes (because of her mom's three daughters) then adorned the collage with three vintage brooches and three ivory buttons. When my great-grandmother passed away, she left tons of boxes filled with lovely sewing supplies, lace, zippers, fabric... anything you can think of in the sewing department. 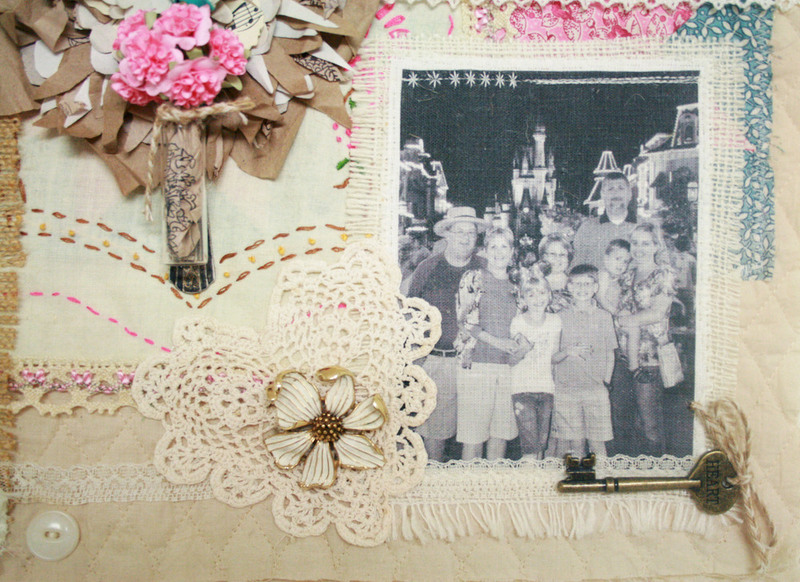 I, of course, wanted to incorporate several of those things into the collage (this theme reminds me so much of her) so I used one of her unfinished fabric squares as the first layer of the collage as well as lace and some of the crocheted doilies I found in the stash. Halee sent me two pictures to use, one of her and her two sisters when they were younger, and the other of her family at Disney World this year. 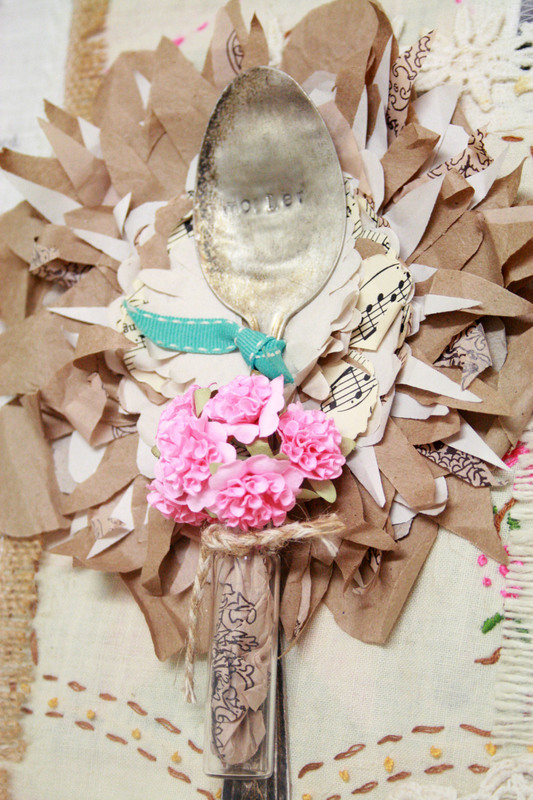 A vintage spoon is the center of the piece with "mother" engraved into it (in hindsight, I was I had used larger-set metal stamps but I used what I had) and a vial of pink flowers laid on a paper flower made of tissue, sheet music and kraft paper. My absolute favorite part of Jitney's is being able to make personalized gifts like this. I've yet to meet Halee's mother, but what an honor it is to create a piece for a woman Halee loves so dearly!